Above: western hemlock tree with drooping leader. Photo by Chanda Brietzke. Right: western hemlock needles. Photos by Chanda Brietzke (top) and Natalie Graham (bottom). Western hemlock is a common coastal species in British Columbia. Both the overall tree structure and the needle arrangement are distinctive. The tree has a drooping leader, meaning that the top new growth droops over. This feature is evident in young and old trees alike. Western hemlock may reach heights of 60m. The needles are arranged in flat, spreading sprays, are of varying lengths, and have white undersides. Western hemlock bark is reddish-brown, rough, and scaly or furrowed in older trees. The cones are small (reaching a maximum of 2.5 cm long) and numerous. They are purple-green when immature and change to brown as they age. For additional photos of tree structure, bark, and cones, please click here. 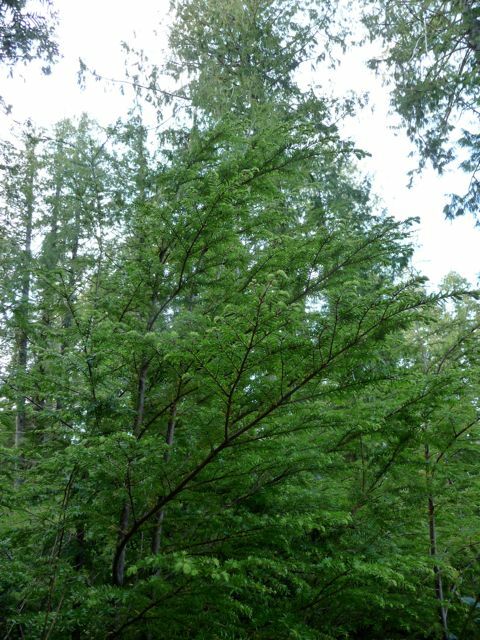 Western hemlock grows in a variety of moisture regimes and soil types, from dry to wet and mineral soil to decaying wood and other organic matter. It is found at low to middle elevations. In BC, western hemlock is found in high densities along the coast and throughout the islands of the south and central coasts. It is also common inland, west of the Rocky Mountains. For a BC distribution map and other information from the BC Ministry of Forests, click here. Outside the province, the western hemlock is found east to western Alberta, north to Alaska, and south to WA, OR, ID, MT, and northern CA. Mountain hemlock (Tsuga mertensiana) is quite similar to western hemlock. It can be distinguished by the needles: they are all equal in length and come from all sides of the branch; this differs from the flat needle arrangement of western hemlock. Mountain hemlock also has longer cones, at 3-8 cm long. Mountain hemlock is generally found at higher elevations, although it may occur at low elevations as well. Western hemlock was an important plant in the culture of indigenous peoples throughout the Pacific Northwest. Applications were diverse, numerous, and varied between cultures. Uses included creating trail markers with the white undersides of the needles, and using branches and sometimes a whole small tree to gather herring eggs (Nancy Turner, pers. comm., June 2011). This practice was reinstated by the Heiltsuk people when they were awarded the legal rights to commercial herring harvest by the Canadian justice system, but was discontinued based on the advice of the elders so that the stock would not be depleted (Larry Jorgenson, pers. comm., June 2011). 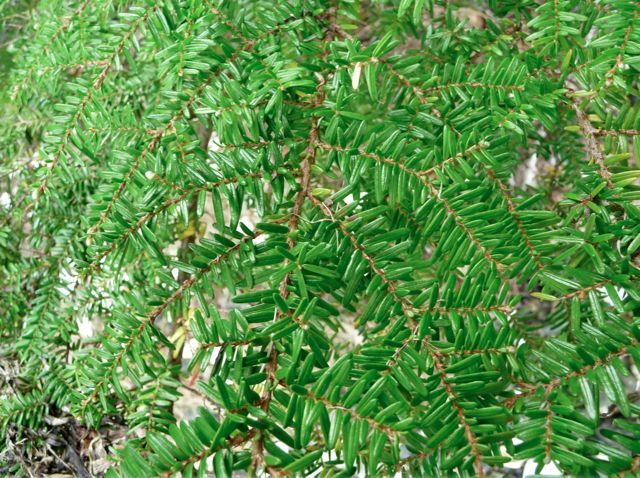 Western hemlock bark is high in tannins, which makes it ideal for use as a pigment or dye and for tanning and cleansing. Materials dyed by hemlock bark included basket materials, nets, and paddles. The wood was also used to make many implements, including combs, spoons, children's bows, and fish hooks. 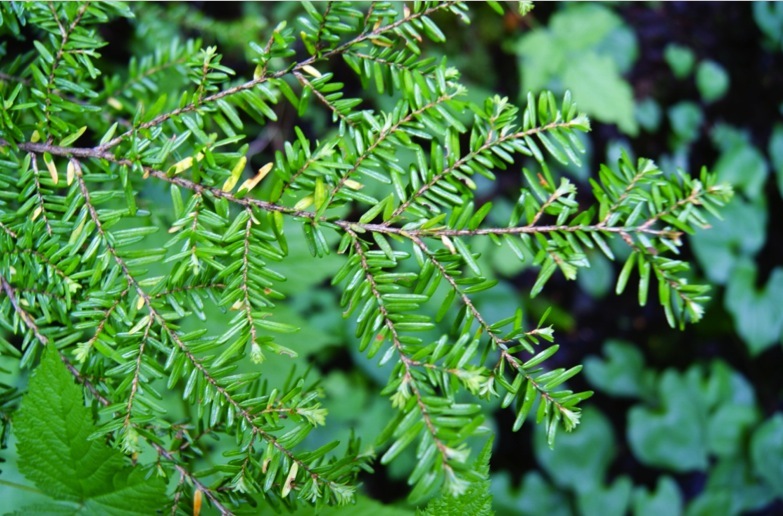 Western hemlock also has traditional medicinal purposes (such as in poultices, sunscreen, and tea) and provided food (for example, the Haida, Tsimshian, Nuxalk, and other peoples in the region ate the inner bark). This is only a brief and incomplete list of the traditional uses of western hemlock, some of which continue to this day. The guidebook Plants of Coastal British Columbia dedicates a full-page to listing the uses of the species and Peoples who used them. Please click here for a blog entry from an Environmental Anthropology course at the University of Washington, where the uses of western hemlock by various societies through time are considered, compared, and contrasted. Pojar, J. and MacKinnon, A. (2005). Plants of Coastal British Columbia, Revised. Vancouver, BC: Lone Pine Publishing. P. 30. Tsuga heterophylla (Raf.) Sarg. western hemlock. In Klinkenberg, Brian. (Ed.). E-Flora BC: Electronic Atlas of the Plants of British Columbia. Lab for Advanced Spatial Analysis, Department of Geography, University of British Columbia, Vancouver. Accessed on 25/04/2013.